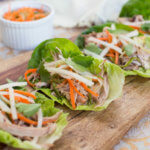 These Vietnamese lettuce wraps are really yummy. You can either make meatballs to serve in them (as explained in the recipe) or else you might prefer to sauté the meat with the ginger, garlic and soy sauce, and serve it that way instead. We are adding crunchy colourful vegetables and also making a simple dipping sauce. This isn't a rich or heavy meal but it is really satisfying. 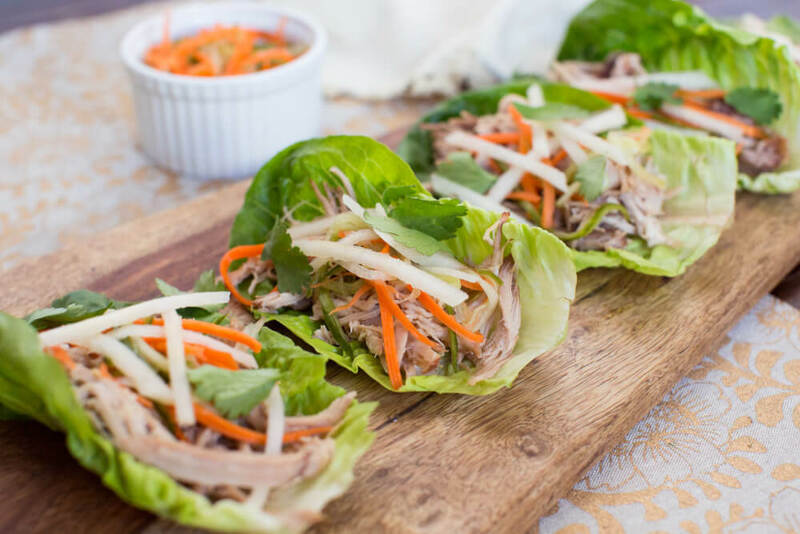 You will love the combination of flavours in these Vietnamese lettuce wraps and it's a light, aromatic dish. Make this if you're looking for something different. If you want to swap the turkey mince for beef mince, go ahead. You could even use something vegetarian like minced mushrooms or tofu if you want to do without the meat altogether. These Vietnamese lettuce wraps are served in different components, so you will add some rice to a lettuce leaf, then add your meatballs and finally the vegetables. Once you have wrapped them, you can dip them in the sauce and enjoy. Have the rice and meatballs warm. They would also work cold or piping hot but warm is best in this recipe. Combine the turkey with 2 teaspoons of the ginger root, a teaspoon of the garlic and 1 tablespoon of the soy sauce. Shape this mixture into 16 meatballs, then roll them into ovals. Cover the meatballs with plastic wrap and refrigerate. Now put the rice and 225ml water in a pan over a moderate heat. Bring it to a boil then turn down the heat and simmer 20 minutes or until cooked. Drain off any excess water. Preheat the oven grill (broiler). Arrange the rice, carrots, lettuce, radishes, red peppers and spring onions on a platter. Whisk the rest of the ginger, garlic and soy sauce with the rest of the water, sugar and lemon juice. Divide this mixture between 4 little dipping bowls. Now thread 2 meatballs on to each of 8 skewers. Grill (broil) for 10 minutes or until done, turning occasionally. To serve, spoon some rice on to a lettuce leaf then add a meatball and some vegetables. Roll up then dip in the dipping sauce.